We previewed the Foundry Overland in May of last year, noting then that the brand had seen some changes in 2015, including re-worked models, and additions of color from a primarily matte black look for much of the brand’s original line-up. 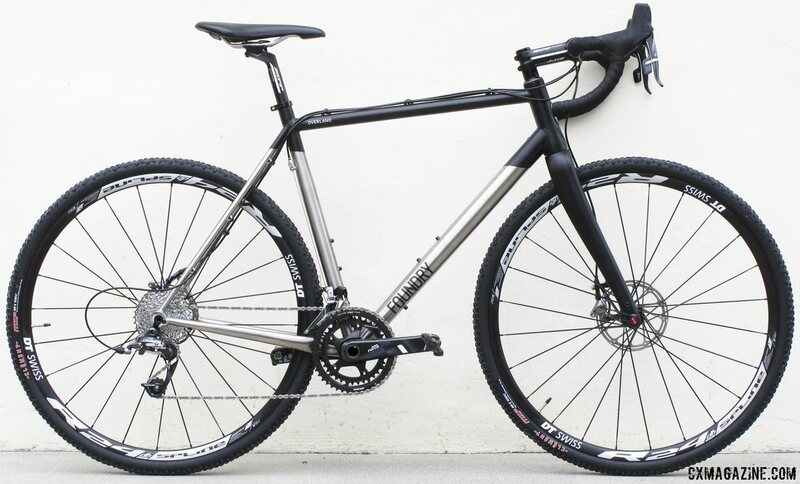 One of the bikes that came about as a result of those changes was the titanium Overland cyclocross bike. 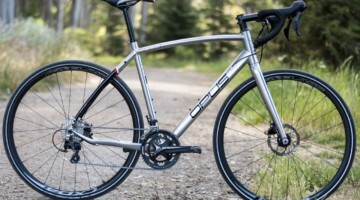 At the time, Foundry had just made the move to titanium in an effort to create a “versatile and timeless cyclocross bike,” that could tackle cyclocross, gravel racing and long rides all while accommodating up to a 41c tire. The Overland also sports fender mounts, adding to the bike’s versatility. 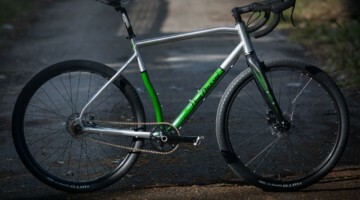 Now the Overland comes in two complete models, a SRAM Force 22 build, reviewed here, and a SRAM Rival 22, which also features the model’s other colorway, a Ti and green frameset that compliments the black one seen here well. Back in May when we first saw the bike we were anxious to get a leg over it and take it on some rides. And Foundry ultimately got us a test bike so that we could do a full review. Originally, our take on the Overland appeared in issue 30, and we’re now bringing you our impressions of the bike here. If you missed the review originally because you don’t subscribe, you can do so here for less than one race entry fee. Here are our thoughts on the Foundry Overland. Scroll through the pages for the full review and photo gallery. The Overland comes as a frame for $2495 USD and the SRAM Force 22 build seen here for $4695 USD. The Rival model saves you a few dollars and sells for $4295 USD. 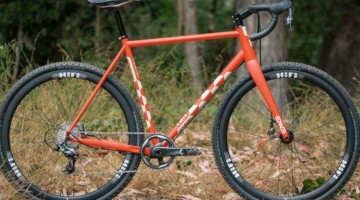 Each comes with a Whisky #9 Cyclocross Fork, which is complete with a 15mm thru axle. The rear dropouts were designed with 12mm thru axles in mind and are spaced at 142mm. the aforementioned matte black or green paint covering the upper forward third of the frameset. This color scheme gives the bike an attractive, unique look for a Ti frame. Unique details include reinforced wire ports on the upper down tube and lower seat tube, so the bike is ready for electronic shift wires. 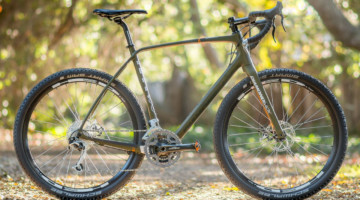 It also features an attractively tapered head tube to accommodate a tapered-steerer fork, and a laser-cut seatstay bridge with the shield-shaped Foundry logo. 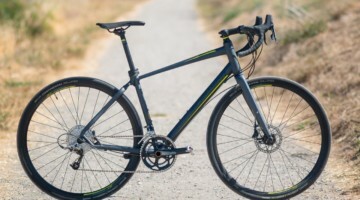 All cable runs are external in a somewhat old-school fashion for a disc-brake equipped bike—all along the top tube, with a cable stop on the back of the seat tube and a reversing pulley for the front derailleur. The rear derailleur runs a full housing from the lever to the rear derailleur, dropping from the top tube down along the front of the right seatstay. That setup is heavy, with potential friction issues, but is sealed from the elements. The rear brake caliper rides at the bottom of the left seatstay, so a reinforcing truss is in place to brace the stay for better brake performance. Geometry is pure cyclocross with no extraordinary parameters. 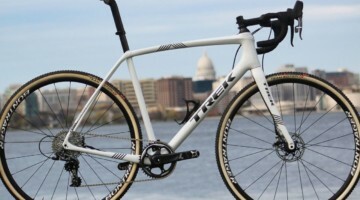 For our 56cm sample, a 56cm effective top tube length, 6.8mm bottom bracket drop, 72 degree head tube angle, and 42.5cm chainstays are all things we would expect on a modern cyclocross bike. Continue reading to see how our test bike was built, and how it performed. cyclocross FoundryCycles those crazy #foundrycycles kids are alright. Mostly.